The NBC Bay Area Investigative Unit obtained and analyzed 25 years-worth of government records to determine how often California's drift gillnets unintentionally catch and kill sea life, including endangered and threatened species. Fishing nets, used to catch swordfish along the California coast, have entangled and killed other sea life by the thousands, according to a months-long investigation by NBC Bay Area. While the number of sea creatures unintentionally captured in the nets has decreased since the 1990s, critics insist the risk posed to wildlife remains far too great. Other states and even the United Nations have taken steps to ban or restrict the use of the fishing nets, known as drift gillnets. However, California fishermen insist the impacts are exaggerated and argue the nets remain the best tool in catching swordfish along the west coast. Steiner leads the Turtle Island Restoration Network, a Marin-based conservation organization, which works to protect some of the ocean’s most vulnerable creatures, including those that have become entangled. Biologist Todd Steiner helps guide a sea turtle to the surface about 150 miles off the coast of Costa Rica as part of his research with the conservation group Turtle Island Restoration Network, which is based in Marin County. Drift gillnets are typically 100 feet tall and can stretch up to a mile long, or roughly the entire span of the Golden Gate Bridge. The holes throughout the mesh nets need to be at least 14 inches wide. The nets must also remain attached to a boat, and can only be dropped into the ocean from about sunset to sunrise. While swordfish remain the main target of the nets, Steiner says the fishing gear indiscriminately catches other sea life. “This is basically a barbaric way of catching fish,” he said. Dolphins, sharks, sea lions and even endangered species of sea turtles and whales are among a long list of sea creatures that have been caught and killed in drift gillnets along the West Coast since 1991, according to an analysis of government records. To determine how often California's drift gillnets unintentionally catch and kill sea life, including endangered and threatened species, the NBC Bay Area Investigative Unit obtained 25 years-worth of federal data. This short-beaked common dolphin is one of 3,478 dolphins that were caught and killed in drift gillnets over the past 25 years along the west coast. The federal government regularly assigns paid observers to go aboard fishing vessels to document everything that is caught in drift gillnets. This photo, taken by an observer, was redacted by NOAA to remove any information that would identify a specific fisherman or vessel (2012). The National Oceanic and Atmospheric Administration, which regulates the use of drift gillnets, randomly places government employees aboard fishing vessels to document how often marine mammals, sea turtles, seabirds, and even fish are caught and killed in drift gillnets. According to an Investigative Unit analysis, fisherman only kept about 22 percent of what their drift gillnets caught over the past 25 years. The rest is tossed back into the ocean – either alive, injured, or dead. Observers only board between 10 and 30 percent of all fishing trips that use the nets. So in order to determine the rate for entire fleet of boats using the nets, the federal government calculates estimated totals each year. According to those estimates, drift gillnets have killed more than 87,000 sharks, 3,400 dolphins and 1,100 sea lions over the past 25 years. The nets are also estimated to have killed more than 380 whales and 100 sea turtles, which include endangered and threatened species. While the federal government does issue guidelines on just how much marine life fishermen should be allowed to accidentally kill each year, fisherman are not penalized when those levels are exceeded. Earlier this month, however, NOAA proposed a new law that would force the drift gillnet season to close down for up to two years if certain types of whales or sea turtles are killed or injured in the nets. Drift gillnets can stretch over a mile long, roughly 6,000 feet, and are typically about 100 feet tall, according to NOAA. The nets began appearing off California’s shores in the 1970s. While fisherman are allowed to also use the nets off the coast of Oregon, all boats must return through California, according to NOAA, since Oregon state law prohibits fisherman from bringing their catch on shore. The use of drift gillnets peaked in 1986 when California permitted 251 fisherman. By contrast, during the most recent season, only 73 permits were issued. Of those only 21 remain active, according to the California Department of Fish and Wildlife. Fisherman Gary Burke holds a portion of a drift gillnet off the coast of Ventura, California (July 8, 2016). Burke says his livelihood depends on drift gillnets and believes the mounting criticism against the fishing gear is unfounded. “It is open ocean, there's always going to be something bad that, you know, you're going to catch, but I think that happens in any fishery,” he said. In 2011, NOAA released its first-ever national report detailing how often marine mammals are negatively impacted by fishing gear across the country. According to the report, California’s drift gillnets kill and injure marine animals at a rate higher than any other type of fishing gear used along the west coast. “For me, it’s a matter of doing right by our environment,” said Senator Ben Allen, D-Santa Monica. Earlier this year, Allen introduced a bill to ban all future drift gillnet permits, but the measure failed. He says he plans to reintroduce legislation that will help keep current permit holders in business, while trying to protect endangered species that are harmed by the nets. “We’ll keep talking to our friends in the fishing industry … and come up with a solution that will both do right by the fishery and fisherman and fisherwomen, and also do right by all these endangered species off the coast who are harmed by some of this technology," Allen said. A dead California Sea Lion is pictured aboard a fishing boat after the crew discovered it entangled in a drift gillnet along the west coast (2011). In the meantime, Allen hopes fishermen will gravitate toward a new type of tool to catch swordfish, known as deep-set buoy gear, which conservationists view as more environmentally conscience since fish are individually caught using lines and hooks that attach to individual buoys. “Show me the better way – I’ll jump right on it, because it’s not easy to work that net,” said Bill Sutton, 62, an experienced California fisherman who uses drift gillnets, but is currently experimenting with the new deep-set buoy gear that is still undergoing trials along the California coast. NBC Bay Area Investigative Reporter Bigad Shaban holds a portion of a drift gillnet while speaking with longtime fisherman Bill Sutton aboard his boat off the coast of Ventura, California (July 8, 2016). Currently, the main alternative to drift gillnets remains harpooning each fish individually, but fisherman argue the practice is far less profitable. Sutton says it would take about five harpooning trips to catch the same number of swordfish caught during a single trip using a drift gillnet. 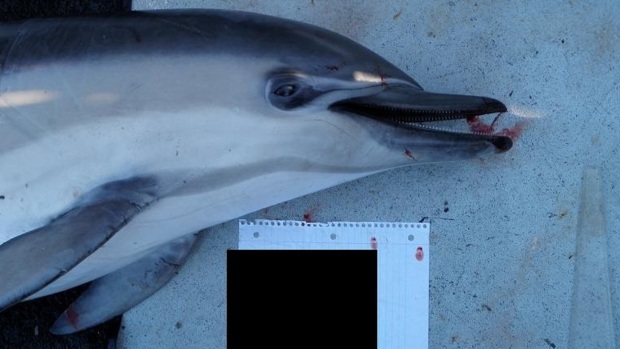 This Risso's Dolphin was caught and killed inside a drift gillnet along the west coast. The federal government regularly assigns paid observers to go aboard fishing vessels to document everything that is caught in drift gillnets. This photo, taken by an observer, was redacted by NOAA to remove any information that would identify a specific fisherman or vessel (2011). Sutton believes if the government banned the nets, consumers could end up paying more for swordfish since fewer fishermen would be willing to make the catch. Additionally, if California’s swordfish fishery closed, Burke says the U.S. would be forced to import more fish from other countries with less stringent fishing regulations. Sutton says California has made considerable strides to reduce the gear’s impact on sea life. Boats are prohibited from using drift gillnets for about half the year in order to protect endangered sea turtles. In addition, drift gillnets must be placed at least 36 feet below the ocean surface so sea life can swim over the top of the nets. Plus, fishermen must now attach noise making devices to the nets to scare away marine mammals. Fisherman Gary Burke holds three examples of noise emitting devices that are required to be placed along all drift gillnets to deter marine mammals. The devices, known as acoustic pingers, have reduced the number of entangled marine mammals by about 50 percent since the industry started using them in 1996, according to government researchers (July 8, 2016). The devices appear to be working. The number of marine mammals caught in the nets has decreased by half in the past two decades, according to government researchers. Over the past five years, it’s estimated 14 whales and four turtles have been entangled in drift gillnets. Despite the decline, Steiner believes it’s impossible to use the drift gillnets responsibly. Todd Steiner, Executive Director of the conservation group Turtle Island Restoration Network, poses with a sea turtle during a research trip off the shores of Cocos Island, Costa Rica. Part 14: How Do You Picture San Francisco?